TORONTO (CP) - Travellers from the United States would rather visit Mexico and the Caribbean than the Great White North, tourism officials complained Wednesday as they urged all levels of government to generate some badly needed buzz about Canada. “Too many Americans are not considering Canada for vacation,” said Rod Seiling, president of the Greater Toronto Hotel Association. Raskolnikov added another factor -- moonbats, of which I ran into quite a few when I took my son to Toronto for his 13th birthday trip to the Hockey Hall of Fame. Spare a thought for the Moose Mountain Mountie, he’s the boringest man on earth… God, there’s a country song in there, please don’t write it! He’s the boringest man on the earth. and not one soul knows what he’s worth. in search of a six-pack of beer. and found himself sitting out here. The boringest man on the earth. And everyone gives him wide berth. and played the kazoo for a night. In search of the great bird in flight. Someday he’ll return to Portage la Prairie. Then we’ll find out just what he’s worth. Thursday was a record day here at Either Orr. Thanks to Kate, this humble blog received more hits and more page views than in any other day in the 10 months or so that it has been in the blogosphere. More than 1,800 page views, nearly 1,400 visits. Thanks, Kate. Thank you, visitors. Y'all come back now, y'heah? Mark A. Rayner continues his labour of love with another Carnival of Satire. Go enjoy it. UPDATE: Carnival of Comedy 40 comes to you from northwestern Washington. It's the only sunshine up there these days. Also, enjoy. In this neck of the woods, which usually gets a few small snowfalls in January (with the odd big one), we received hardly a trace of snow in January. Remember, the prevailing winds at this time of year come out of the northwest. What happened in Canada in January? Nothing to worry about here. Move along. UPDATE: I guess we'll be paying for a snow-free January. Punxsutawney Phil saw his shadow. Six more weeks of winter ahead. OTTAWA (CP) - Canada's natural governing party took its first tentative steps toward reconstruction and reconciliation Wednesday when defeated Prime Minister Paul Martin named Bill Graham as his interim Liberal replacement. Bruce Cheadle wrote it. But editors approved it. UPDATE: Well, well, well. As of late this morning (after the original post), a new lede has appeared. OTTAWA (CP) - The Liberal party took its first tentative steps toward reconstruction and reconciliation Wednesday when defeated Prime Minister Paul Martin named Bill Graham as his interim Liberal replacement. If I only had saved a screen shot. Also interesting is that CP's Web site has stories -- last updated Jan. 27. UPDATE 2: I got lucky... The London (Ont.) Free Press still has the original as of 1:30 this afternoon. UPDATE 3: Chris, the spiritual successor to Sgt. Preston of the Yukon, and Joel, the Northland's Lee Greenwood, have screen captures at their sites. UPDATE 4: At 10:08 Friday, just a little more than 24 hours after the original post, this post was visited by... the Canadian Press. When President Bush delivered his State of the Union address last night, I had a very odd flashback... to a 1980s video. Now if we could get Frank Trainor to record this... but who would we get for the ladies in the video? Out of the woodwork has come another genu-wine candidate for Liberal Party leadership. The Liberal Party of Canada is looking for a new leader in the wake of last week's election debacle that saw the party of Paul Martin Jr. lose its minority government to a party that did not exist three years ago. Look no further, ye lost of the Libs. Your saviour awaits. Yes, he does live in Massachusetts now, but he can certainly afford to find a place in LaSalle-Emard from which to open his campaign. In the particulars, he would fit in perfectly. After all, a one-time Harvard professor is being considered as a serious candidate for the Liberal Party leadership. Why not John Kerry? He's not unattractive, I suppose. He speaks French rather well (better than English, in fact), a requirement for leadership in Quebec. He has no principles ("I voted for it before I voted against it."). And he wants to run a country. Want gay marriage? He used to be against it, but he can be for it. Hate the military? He used to be in it; now he's against it. John Francois Kerry and the Liberal Party -- perfect together. ...unless it disagrees with them. Liberal activists -- among them graying leftovers from the Vietnam-era antiwar movement -- plan to gather near the Capitol tonight, banging pots and pans to drown out President Bush's State of the Union address. Yesterday, opponents of the Iraq war kicked off their latest round of demonstrations with an "Impeachment Forum" held downtown in a private dining room at Busboys and Poets. Featured speakers were 78-year-old former U.S. Attorney General Ramsey Clark; longtime war protester Marcus Raskin, 71, who is head of the Institute for Policy Studies; and Cindy Sheehan, mother of an American soldier killed in Iraq. OTTAWA (CP) — The Mounties have charged a former Defence Department bureaucrat and two other men in a $100-million fraud involving computer maintenance contracts. Paul Champagne, who was fired after billing problems came to light more than two years ago, is charged with fraud, obtaining more than $105 million from the government under false pretences, money laundering and other counts. Peter Mellon and Ignatius Manso were charged with fraud, false pretences, possessing and transmitting the proceeds of crime and making false statements. The police revealed few details, saying the matter remains under investigation. The RCMP was called in by the Defence Department in 2003 to investigate irregularities in computer maintenance contracts with Hewlett Packard. Internal audits had found what appeared to be a scheme involving phoney invoices. HP Canada — formerly Hewlett-Packard — eventually repaid the federal government about $146 million, saying there was no evidence its own employees were involved in the scheme. The RCMP said their investigation focused on Champagne and several third-party vendors and called it unfortunate that the reputation of legitimate companies might have been affected by the criminal actions of others. Where did that money go, eh? And what is it about former postal workers? GOLETA, Calif. (AP) — A female ex-postal worker opened fire at a mail processing plant, killing six people and critically wounding another before committing suicide, authorities said early Tuesday. 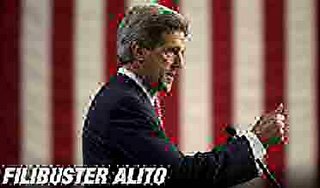 As you probably know by know, Sen. John Kerry (D-Massachusetts and Switzerland), the failed 2004 presidential candidate, plans to filibuster the nomination of Judge Samuel Alito to the U.S. Supreme Court. Kerry made the announcement in Switzerland while on a ski trip, which he made in order to get himself into better physical condition for the marathon speechmaking required of a filibuster. Unlike the 2004 election, in which he showed himself to be woefully unprepared for the nation's highest office, Kerry will be totally ready for his moment in the spotlight. 1. Make a trip to the tanning salon. Gotta look good for the TV cameras, eh? 2. Get a shot of Botox. Ditto. 3. Stock up on No-Doz (TM). John Kerry speeches are a known cure for insomnia, and he can't be putting himself to sleep, now, can he? 4. Get the latest Los Angeles white pages. He'll need something to read to help occupy the time. 5. Carry a laptop with speakers, plus CDs of his 2004 campaign stump speeches. Gotta sneak those in while the Senate's asleep, huh? There you have it. John Kerry's filibuster preparations.